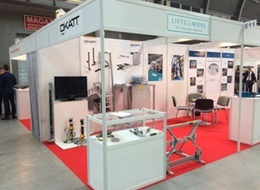 OKATT has tested with success at ItaInnova the new Buffer Support for Reduced Headroom. Check out this VIDEO to watch one of the tests. This product has been designed according to the EN80-20 and can be installed on the pit, behind the counterweight, having just a 35mm thickness. CONTACT US to get more info about the produt.